Pittsburgh again looked like the high-powered juggernaut fans have grown accustomed to watching in its 6-5 overtime victory over the Boston Bruins. The Penguins returned to a strategy which helped fuel their early-season success – a solid transition game, shots on goal, traffic in front of the opposition cage and a never-say-die attitude. Boston came into the game on a bit of a roll with points in four-straight games. Pittsburgh took one-goal leads on four separate occasions by midway through the final frame but each time the Bruins responded to tie the score, finally going ahead on a Marco Sturm goal with 2:29 left in regulation. Inspired by a crowd that was alive with energy from the moment Evgeni Malkin took the ice before the first period, the Penguins made sure to give the fans something to cheer about. Bill Guerin tied the score with 0.4 seconds remaining in regulation. It was fitting that Pascal Dupuis would score the game-wining goal in overtime, as he helps define why this team is so special. When the Penguins are clicking on all cylinders, their superstars perform at an all-world level while character guys such as Dupuis chip in with key plays at timely moments. Look for Pittsburgh to use this game as a springboard to get back to the level they played pre-injuries. PITTSBURGH (AP) – Pascal Dupuis scored his second goal of the game 1:24 into overtime and the Pittsburgh Penguins welcomed back star forward Evgeni Malkin by snapping their four-game losing streak with a 6-5 win over the Boston Bruins on Saturday night. Malkin, the reigning NHL scoring champion, had three assists in his return to the lineup after he missed seven games because of a shoulder injury. A strategy that has paid off numerous times in the past when goals have been tough to come by, head coach Dan Bylsma placed Sidney Crosby and Evgeni Malkin together. The move paid off as the Bruins had trouble matching the speed and creativity of the dynamic duo. Between the two they accounted for one goal and five assists as Crosby finished with one score and two helpers, and Malkin registered three assists. The Penguins took three one-goal leads in the opening 40 minutes and twice had chances to stretch that lead but failed to convert with the man-advantage. Boston came back shortly after each kill to tie the game. Overall the Penguins were 0-for-3 with the extra skater. He could have gone the whole night without making an offensive contribution and Evgeni Malkin still would have provided a difference for the Penguins. Just his stepping onto the ice revved up the home crowd and added an extra dose of energy into the arena. Malkin did not take long to make an impact, setting up a Jay McKee goal 1:42 into the contest with a nifty pass at the Boston blue line. It was the 200th career assist of Malkin’s career. He helped send the game into overtime with his right-on-the-tape cross-ice pass to Bill Guerin for the game-tying goal with just 0.4 seconds remaining in regulation. Malkin finished with three assist and a plus-3 rating while logging 26:37 minutes of ice time. Evgeni Malkin did not take long to make an impact, making a gorgeous pass at the Bruins’ blue line to a streaking Jay McKee cutting through the slot. McKee came in against Tim Thomas and made a move to the backhand to beat the reigning Vezina Trophy winner top shelp. Pittsburgh 1, Boston 0. Boston tied the score on a weird play which began below the Pittsburgh goal line. David Krejci controlled the puck against the boards and slid a pass to the right of the crease to a wide-open Blake Wheeler, who deposited the puck into an empty right side of the cage. Pittsburgh 1, Boston 1. Ben Lovejoy made a great play at the blue line to keep the puck in at the right point, throwing a wrist shot to the net. 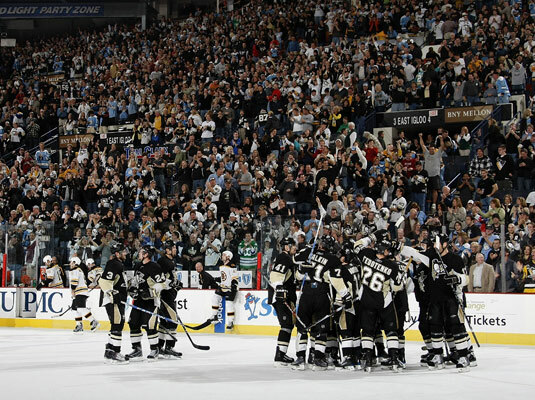 Matt Cooke deflected the shot on the way into Thomas, and Pascal Dupuis slammed home the rebound. Pittsburgh 2, Boston 1. Wheeler forced a Penguin turnover just inside the Pittsburgh zone early in the middle period, springing Michael Ryder on a break down the right side. Ryder’s snap shot beat Johnson over the shoulder. Pittsburgh 2, Boston 2. Sidney Crosby regained the lead for the Penguins with a slick deflection midway through the second period. Malkin passed the puck from the far-corner boards to Alex Goligoski at the right point. His slap shot through traffic went off the stick of Crosby past Thomas. Pittsburgh 3, Boston 2. Derek Morris drew the game even for the third time when his shot from the left point got past Johnson late in the second period. Pittsburgh 3, Boston 3. Pittsburgh struck first in the final 20 minutes when Crosby took an outlet pass from Ruslan Fedotenko and skated the puck down the left-wing boards into the Boston zone. He delayed and found Mark Eaton up on the play in the slot. Eaton’s one-timer beat Thomas through the five-hole. Pittsburgh 4, Boston 3. Boston came back to tie the game up for a fourth time during a five-on-three power play as Zdeno Chara’s slap shot from the left point went off the pads of Johnson and onto the stick of David Krejci in front. A wrist shot by Krejci past the stick side of Johnson knotted the game. Pittsburgh 4, Boston 4. The Bruins took their only lead with 2:29 to play in regulation as Mark Recchi worked the puck to Chara again at the left point. This time his slap shot was deflected on the way to the net by Marco Sturm past Johnson. Boston 5, Pittsburgh 4. Just when it appeared the Penguins were finished Bill Guerin sent the Bruins reeling into overtime. Taking a pass in the right-side circle, Guerin unleashed a powerful wrist shot behind the stick side of Thomas with just 0.4 seconds left to play. Pittsburgh 5, Boston 5. In overtime, Thomas went behind his net to stop an end around, but Jordan Staal picked his pocket and fed the puck in front to an uncovered Dupuis for his second goal of the night and the 100th of his career. Pittsburgh 6, Boston 5. Anytime there is a one-goal game there are many plays that can be singled out after as crucial to determining the outcome of the game. Through 20 games the Penguins have been one of the league’s top teams in terms of stepping in front of the opposition’s shots. Ben Lovejoy, playing his second game of the season, went down to his knees to block a Mark Recchi shot from the left of Brent Johnson less than three minutes after the Bruins had tied the game, 1-1. Recchi scores there and a previously-slumping Penguins’ team could have been on the ropes again. Forward Mark Letestu made his NHL debut for the Penguins against the Bruins on Saturday night after getting recalled from Wilkes-Barre/Scranton in the morning. Playing center on a line with Pascal Dupuis and Matt Cooke, Letestu recorded two hits and went 3-for-4 on draws in 8:16. Although they eventually allowed a David Krejci tally, Pittsburgh did an admirable job killing off a sequence in the third period where Matt Cooke was penalized four minutes for high-sticking Byron Bitz and Sidney Crosby received a tripping minor during the kill. Brent Johnson made a few sparkling pad saves as Craig Adams, Mark Eaton, Jay McKee, Jordan Staal, Ben Lovejoy and Alex Goligoski killed a majority of the penalties. Defenseman Deryk Engelland, playing in his third career game, got into the first fight of his young career when he squared off with Byron Bitz 6:42 into the first period. In addition to firing up the crowd, Engelland appeared to get the better of the scrap. > Pittsburgh concludes their mini three-game homestand on Monday night when they play host to the Anaheim Ducks at Mellon Arena. Faceoff is slated for 7:30 p.m. Following that contest the Penguins will play five of the next seven games on the road. > The Penguins are now 31-10-4 in the regular season since head coach Dan Bylsma took over. They have a record of 16-5-1 at Mellon Arena. > Pittsburgh improved to 9-1 when scoring first. They have a 10-2 mark when registering 30 or more shots. > Since Bylsma took over as head coach the Penguins have a record of 23-0 when scoring four or more goals, including a 9-0 mark in ’09-10. > Evgeni Malkin didn’t take long to reach a personal milestone, registering his 200th career assist when he set up Jay McKee’s goal 1:42 into the game. The goal was McKee’s first as a Penguin. > Malkin finished the evening with three assists, the fifth time on the season he has registered multiple points, including his second three-point effort of the season. The Penguins are 5-0 when Malkin records two or more points. > Sidney Crosby registered his first three-point effort of the season with one goal and two assists. Crosby leads the Penguins in scoring at the quarter point in the season with 20 points (10G-10A). > Pascal Dupuis recorded the first two-goal game of his Penguins’ career. Dupuis’ overtime tally was the 100th goal of his NHL career. > Ben Lovejoy, playing in his fourth NHL game and the second of this season, picked up his first career point when he assisted on Dupuis’ goal in the first period. > Alex Goligoski picked up an assist against the Bruins to give him 14 points (6G-8A), most by a Penguins defenseman through the first 20 games. He continues to rank fifth (tied) in plus/minus at plus-11. Goligoski’s six goals are tied for second behind Atlanta’s Zach Bogosian (7).